Home AF Cares Help Save The Endangered Belize Jaguars! A Belize jaguar relaxing in the jungle. I found paradise in Belize! The Kanantik Reef & Jungle Resort is an eco-sensitive, luxurious resort secluded on 300 acres in Southern Belize, and displays a beautiful 1,300 foot private, palm-fringed sandy beach. The Mayan calendar wasn’t correct when predicting “the end of time” on December 21st – but the 25 individual, spacious, thatched-roof cabanas replicating the ancient Maya culture with luxurious touches at Kanantik is spot on! Kanantik Resort also hosts the only wood burning pizza oven in the entire country – love my pizza wherever I go. Kanantik’s surrounding tropical nature and amazing variety of wildlife makes you feel as though you are in the middle of the jungle minus modern mainstay technology like the television. Believe it or not, I haven’t discovered one poisonous spider amongst the paradise backdrop either! Jungle myth has it that Sebastian the crocodile that roams the Kanantik canal considers dog a delicacy. Good thing I didn’t bring Baby Hope along for the ride, Belize is not the best place for dogs, but certainly is the destination for breathtaking nature. The resort is near the pristine reef and allows guests the unique opportunity to explore the best of the underwater world, bridging the jungle and the reef. One of Belize’s main attractions and quite possibly one of the seven (or eight) wonders of the world is The Cockscomb Basin Wildlife Sanctuary. This spectacular sanctuary consists of forests, fauna and watersheds approximately 400 square kilometers located at the eastern slopes of the Maya mountains. Established in 1990, there is over 128,000 acres of lush jungle ringed by the spectacular Cockscomb Mountains. The sights and diversity are accessible to both the casual visitor and the serious naturalist through a series of nature trails. A Cockscomb Basin Wildlife Sanctuary jaguar taking a refreshing and carefree break. Besides being the home to hundreds of species of plants with exotic leaves and flowers, colorful insects, singing birds, furry mammals, scaly reptiles, and wide-eyed amphibians, The Cockscomb Basin Wildlife Sanctuary is world renowned for being the first jaguar reserve. 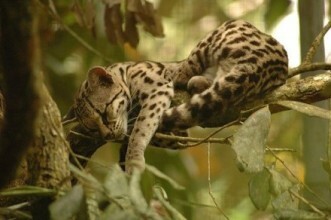 The sanctuary is home to all five of Belize’s cats: jaguar, puma, margay, jaguarundi, and ocelot. 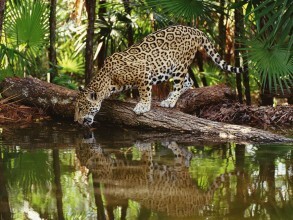 It is estimated that over 80 resident jaguars are in the area. The jaguar is the third largest cat in the world after the tiger and lion, and is the only member of the large cat genus to live in the Americas. An adult male can weigh up to 200 lbs and measure 6 ½ feet from nose to tail. The International List of Endangered Species declared the jaguar in need of international protection. Habitat loss and retaliatory killing continue to threaten the survival of the species. Populations have been greatly reduced in areas where humans have settled. The World Wildlife Fund (WWF) is doing whatever they can to save the majestic jaguars. WWF is providing big cat lovers with the opportunity to adopt a jaguar (gifts.worldwildlife.org/gift-center/gifts/Species-Adoptions/Jaguar.aspx) and help save this rare animal! Even Jaguar Cars is rallying support for their namesake, and now so can you! “The Cockscomb Basin Wildlife Sanctuary is a magical place where wonders and diversity are accessible to both the casual and serious visitor,” commented Mark Nolan from the World Wildlife Fund. Here’s a tidbit I just had to share; some groups of Maya, known as the Jaguar people, worshipped the jaguar or “Baalum” believing their kings would reincarnate into these cats and so killing a jaguar was a serious crime, punishable by death. The Mayans didn’t mess around, and maybe neither should we – let’s do all we can to save the beautiful jaguars and paradise! Previous articleTraveling To New Heights With Your Furry Friend! Next articleAll Hail Your Royal Meow-ness! Respect Your Cat Day is March 28th!